We left Nelson bay on the southern coast of Port Stephens 06.00 Thursday 21st for a day sail to Camden 81 miles north. 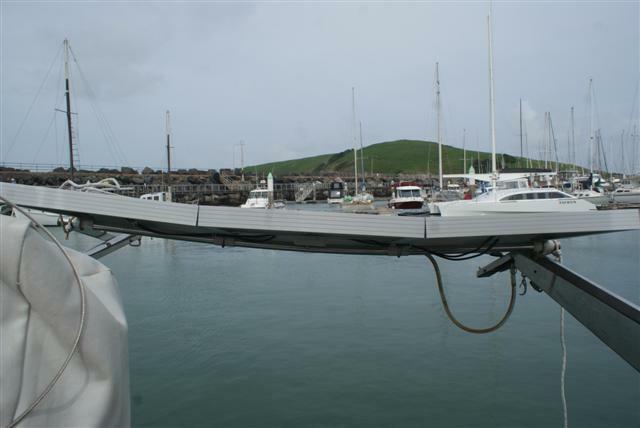 The early morning forecast was for a southeasterly 10 – 15kts with a 1-metre swell. There was increased wind forecast to arrive much further north the following evening and heavy airs the day after that giving us between 36 and 48 hours to do a 12-hour passage. 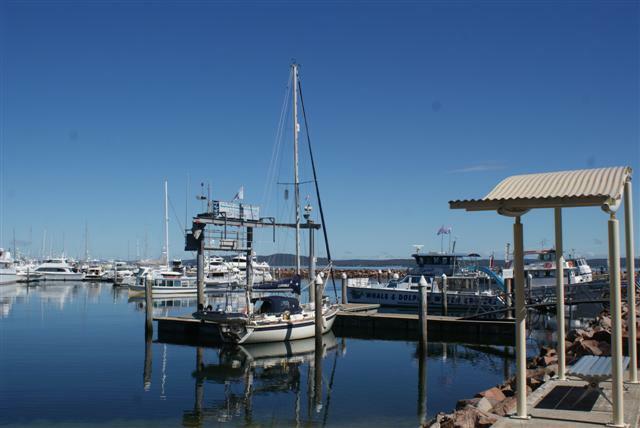 We had been in Port Stephens for 10 days and it was time to move north towards our rendezvous with my sister Kate and her family who were to fly to Brisbane on 14th March. We hoisted full sails motoring for an hour to the entrance and after rounding the headland we turned off the engine and sailed gently on at 3 – 4kts gradually picking up more wind from the south east. At 10.00 we rounded Sugarloaf Point, the wind perked up to about 18kts and we were zipping along nicely, we would easily reach Camden by 5 or 6pm. After all that time sitting gently at anchor, the short chop made Sue a little queasy so she retreated below for a short snooze. All was well. At 14.00 we were off of Cape Hawke and the wind had picked up to 22kts so we put the first reef in the main and rolled away some of genoa. Passing Crowdy head at 17.00 we were greeted by a wonderful display of dolphins. They were swimming from right to left and seemed to be pointing to Crowdy head harbour; did they know something we didn’t? The wind was still south easterly and blowing 20 – 25kts, well within our comfort zone but up on the forecast. As we approached shallow water the swell kicked higher but, looking ahead at the entrance I was appalled to see a wall of white water breaking heavily right across the bar. I took her as far as the 4metre contour but realised that the conditions were dangerous so aborted our approach and turned back into deep water. Now what? The strengthening southerly ruled out a return to Port Stevens so we called the VMR (voluntary marine rescue – a cross between the coastguard and the RNLI) on the vhf. They confirmed my feeling about the entrance and suggested we try Port Macquarie or, failing that, the deeper Coffs Harbour. An hour later we called the VMR at Port Macquarie and they confirmed their entrance was also treacherous leaving us no option but to continue overnight to either Trial bay, which faces north and would give us some protection from the southerlies, or Coffs harbour, 80 miles distant. We were now getting 25kt winds from the south east with 30kt gusts and a rising easterly swell making things very uncomfortable. Needless to say the forecast had changed beyond all recognition now but, as we put a second reef in before dark, alarmingly the VMR were now forecasting strong wind warnings coming much earlier than predicted all the way up the coast. The weather system was accelerating well beyond expectations. Our passage window had all but closed so now we had to make best speed and find what shelter we could. We were in for a busy night but Sue found a chilli in the freezer and managed to heat it up for dinner despite the rapidly deteriorating conditions. Unfortunately she took one mouthful and promptly brought it back along with her lunch. She then decided she felt better, ate the rest of it and kept it down! It was a difficult overnight passage because the swell had now gone round to the east and was slapping us sideways making sleep almost impossible as the sails and the steering needed constant attention. The Hydrovane wasn’t coping with these conditions well on its own so I engaged the electric autopilot as well and between them they kept our course more steady. By 22.00 the winds were 30kts with 35kt gusts. After good early progress we had also found the south flowing East Australia current which, having given us several knots of speed on the way down, was now pushing hard against us as we clawed our way north through occasional but intense squalls and lashing rain. After an arduous night with very little sleep we had progressed slowly up the coast. At 06.00 we had travelled 130 miles in 24 hours and tried calling the VMR at Trial bay. They reported that there was some shelter in the southern corner of the bay but the bar across the river was impassable as expected. We considered anchoring for a few hours to get some sleep but the weather was clearly deteriorating and they were forecasting that the wind was going back to north which would put the Trial Bay anchorage on a dangerous lee shore. It was a harsh knock to hear the storm warning called. By 09.00 we were getting full gale force wind of 35 to 40kt with 45kts gusts in heavy squalls. We were also now able to hear Coffs harbour VMR on the radio, called in our position and said we were battling towards them. The officer on watch gave us the grave news that Coffs Harbour like all ports within 100 miles were closed due to the conditions and approaching storm. We were later told it’s only been closed 3 times in the last 20 years. The trap was sprung. We were alone in foul conditions, on a lee shore with no where to go. We put the third reef in the main and hove to under a scrap of genoa trying to get some rest before we were hit by the full force of the weather. I lay down on the saloon sole and Sue wedged herself on the leeward saloon berth but it was impossible; like sleeping in a washing machine. By now the swells were 4 metres and we were being buffeted by rogue waves. We couldn’t go back against the wind, the weather was coming from the north so we didn’t want to go further, the swell was coming from the east and to the west was a lee shore. The boat was coping ok at that point but then I noticed that the top car on the main sail had broken away from the sail. We had to motor head to wind to get the sail down so I could try to repair it. We raised the sail again but half an hour later it had broken again and was flapping wildly promising to break free altogether. After turning into the wind again a big gust whipped it badly and it started tearing. We fought it down and lashed it firmly to the boom so it couldn’t do any more damage to the stack pack which had been ripped by the flailing main. 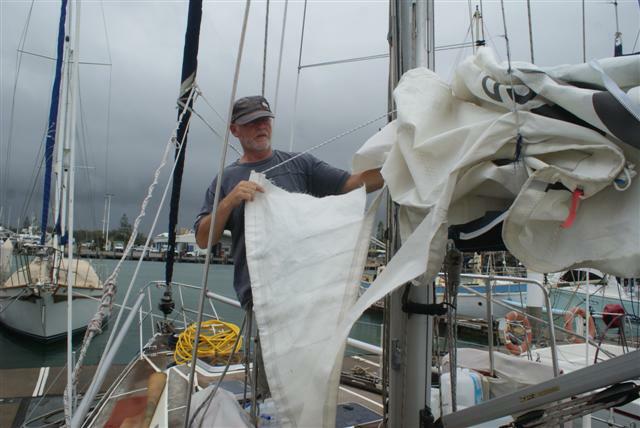 We were sitting ducks without the mainsail so oriented the boat northeast to close with Coffs and get some more sea-room with just a scrap of genoa and trailing a drogue to keep us from broaching on the waves. Unfortunately the waves were now coming at all angles so we were still getting green water over the decks and one rogue wave came over the starboard quarter knocking us down, at the same time water poured over the side and down the hatch flooding onto the navigation table. Sue quickly grabbed towels and started mopping but there was water every where. All our charts for the next part of our trip to SE Asia were in the chart table and Sue lifted them out quickly laying them on the fore peak bunk to dry out. Water had got into the electrics and the wifi dongle was swimming so that was unlikely to work again. Later, Sue was sitting up in the cockpit keeping watch when another breaking wave hit the side of the boat and poured into the cockpit again. 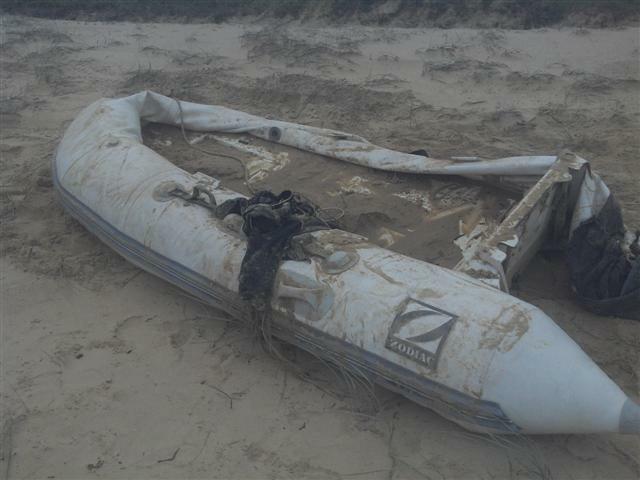 This one ripped the spray hood and the weight of the water bent the davit leaving the dinghy hanging perilously half in and half out of the water. We were to have a further 2 knockdowns during the next 24 hours with spreaders in the water and solid green water sluicing over our cockpit combing. I rushed to the aft deck to try and do something to save the dinghy but it was too late. I considered towing it on a long line but realised that the last thing I needed now was a rope around the prop so I got my knife and cut it loose. 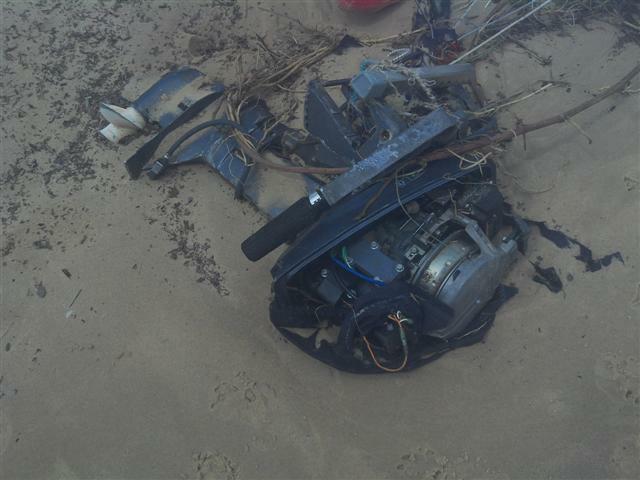 I think that was the worse moment for me as we watched our dear little dinghy with Sue’s homemade cover and clever beaching wheels float forlornly away into the chaos. I was sure I would never see her again. Some breaking waves continued to hit us though doing more damage but thankfully mostly superficial. Good old Westerly “tough as old boots”! Sue was doing fantastically well despite being obviously really frightened because we just didn’t know how long this horror was going to last. The VMR, clearly concerned, were keeping a two hour schedule with us, updating us as soon as a new forecast came out and were keeping police and rescue authorities appraised of our predicament. Sue was also in contact with our dear friends Dave and Jacqui on the yacht Jackster by text looking for any glimmer of hope that the wind was abating. It’s good to talk, at any rate it keeps your morale up and we were both in need of that. We stayed out for a second night being blasted by 60kt gusts and huge waves. Sue was so scared; it was a lot worse than the Columbian coast but we hugged and got on with it, what a lady! After 24 hours sitting outside Coffs harbour lying-a-hull with a drogue (which I had to relay 4 times) and a failed autohelm we assumed we could go in the next morning but the VMR informed us they still had white water right across the entrance. We motored back out to sea for a couple of hours to relay the drogue and went down below, put the hatches in and pretended it wasn’t happening; in fact we both went to sleep, we were exhausted. We woke up at 10am and looked out to see that the wind and swell had both dropped slightly. I called the VMR and asked them to describe the conditions at the entrance. They informed us that the wind had dropped a bit, there were periods of slight swell but they still had 3-4 metre breakers. However they considered, with the tide relatively high, there was a minimum of 4 meters depth. The forecast was for worsening weather and, although we had no serious structural damage I was concerned about the cumulative effect of the problems we did have. I had only just managed to bring the instruments and autopilot back on line with a jury rigged by pass in the electrics and had some concern that they had been affected by the electrical disturbances during the night. We sorely needed to get in so I decided to go in and “loiter” near the entrance waiting for a smoother patch before making a dash. Finally I saw a door in the swells open and piled the power on hell for leather towards the entrance. Just when I though I had got it right a wave reared up behind us, followed by another and then a final huge breaker. I really thought we were going to broach or pitch-pole but surging forward in it’s powerful churning foam we surfed for a full 20 seconds, the longest 20 of my life but we made it with the VMR guy guiding us on the radio and the boat equivalent of a handbrake turn into the calm of the inner harbour. Once in the marina it all calmed down and we motored to our berth. Sue just burst into tears of relief, we had made it and were greeted by a group of VMR’s, yotties, and marina staff who had been following or supporting us in our drama. Our heartfelt thanks go out to all of you who have helped and befriended us, it means more to us than I can describe. Thank you. We didn’t take any photos during the event but these are some of the damage. 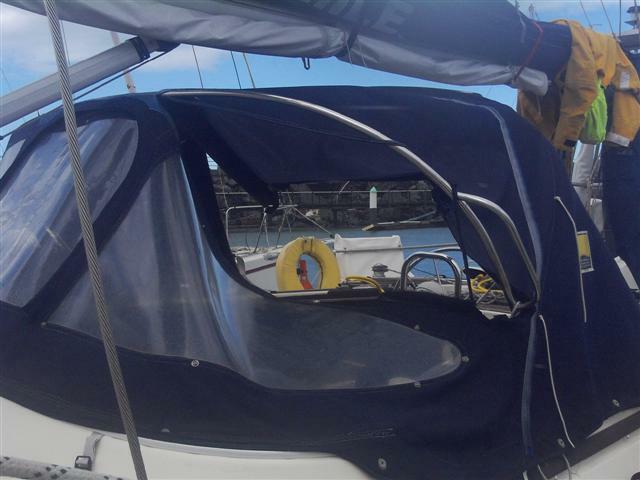 Posted on February 24, 2013, in Circumnavigation, Port posts, Redgrove, Sailing, sailing adventure, Westerly, Westerly Sealord and tagged F10 storm. Bookmark the permalink. 11 Comments. Wow, that was terrifying. Glad to hear all are ok! I have put a link to your inspirational blog on the Westerly members site. Wow what a harrowing experience! Hoping that with sleep and calmer seas you’ve both recovered! On our entry into Coff’s we were told that yachts had previously ended up on the beach when surfing in, it must have been such a relief to arrive safely. Hoping that we catch up with you both along the coast as we are taking Dreamweaver to Mackay from Brisbane over the coming Easter holidays. May your remaining trips be nothing but fair winds and following seas… you deserve it! !